Do you believe that periods are contagious? That must be the reason why you and your bestie always seem to get your period around the same time, right? Not so fast. According to a new study, women’s menstrual cycles don’t actually sync up. The study found that the opposite is true: Women’s cycles are more likely to diverge than come together over time. Conducted by the University of Oxford and the period-tracking and fertility app Clue, the study looked at data from 360 pairs of women who lived together. The researchers looked at a minimum of three consecutive cycles for each pair. The data scientists found that 76 percent of the pairs had a greater difference in menstruation start dates at the end of the study than at the beginning. Only 79 of the 360 pairs had a smaller gap between the start dates of their periods when the study ended. The researchers also noticed that living together did not increase the likelihood of period syncing. Sorry, roomies! “As disappointing as it may be, it seems that there is now overwhelming evidence to suggest that menstrual synchrony in humans is no more than a methodological artifact from one study that has since turned into an urban myth,” said Dr. Alexandra Alvergne of the University of Oxford. You can’t blame anyone for believing in the myth of period syncing: There have been more than a few studies claiming it exists. Alvergne notes that the first period-syncing study was published all the way back in 1971. It introduced the theory of the “alpha uterus,” which was thought to be a “uterus with a strong hormonal pull that influences the cycles around it to ovulate and menstruate in unison,” according to Alvergne. She explains that other bogus theories attribute syncing to “socially mediated synchrony,” which proposed that women get their periods at the same time so that they’re sexually receptive at the same time. Theorists thought that if women were sexually receptive at the same time, this would minimize the risk that a female would get sexually monopolized by a single male. Apparently, this theory has been proven patently false. If you were a firm believer in the period-syncing myth, don’t feel too bad — you’re hardly alone. LADIES! Do your periods sync up with your friends and family members, and/or do you believe that period syncing is real. But now that it has been debunked, are we still convinced that girlfriends are deeply in sync with each other’s thoughts and emotions? Of course we are. That’s just common knowledge. 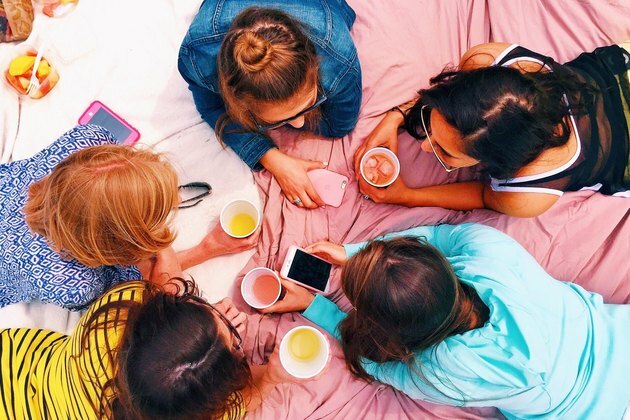 Do you find that you get your period around the same time as your friends or roomies? Do you think more funding should go toward research on menstruation and ovulatory health?